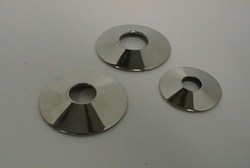 Nippeldisks 3 cm diameter polished. Made of high quality stainless steel and shiny polished. Best party jewelery for your breasts. Available in innerdiameters from 9mm till 12mm innerdiameter in steps of 1 mm. A must for people with niplle piercings.